Maize opened with 42-22 victories against Newton and a 40-28 victory against Salina South, then the No. 1 team in Class 5A. In Week 1, Salina South defeated Derby, then the No. 1 team in Class 6A. Maize has not reached the playoffs since 2009 and not won more than five games since an 8-3 season in 2006. Maize has lost six straight to Derby, including 41-0 last season. Six of the last seven contests have come by at least 19 points. Last week, Maize quarterback Connor Lungwitz completed 22 of 30 passes for 145 yards and four scores. Salina South had closed within five points in the final minute, but Maize recovered an onside kick. Salina South had nine penalties. Derby bounced back from the 41-35 loss to Salina South with a 55-7 victory against Andover Central last week. Derby collected seven sacks for minus-33 yards. Overall, Andover Central had minus-6 rushing yards. Deandre Goolsby returned a punt 69 yards for a score and hauled in a 9-yard scoring pass. Quarterback Jeremy Dunham threw for 129 yards and accounted for three scores. Tyler West rushed six times for 104 yards, including a 53-yard touchdown run. West left the game shortly after that run with a leg injury, and his availability against Maize is uncertain. Maize caught Salina South after the big victory, but Derby is too talented across the board. Wichita Heights lost 45-12 to Bishop Carroll before it rebounded with a 45-0 victory against Wichita South. Heights and Dodge City have met three times since 2007; Heights has won the three games 42-12 and 42-38 in the playoffs and 39-24 last season. Trenton Autry paced the Falcons with 132 yards and two scores and Tre King tacked on three rushing scores in the win over Wichita South. Dodge City opened with 44-6 victories against Wichita Southeast and a 33-7 win versus Wichita Northwest last week. Quarterback Kelan Newton completed 20 of 32 passes for 192 yards and two scores in the season-opening victory for Dodge City. Newton passed for 165 yards and a score and ran for a 52-yard TD. Newton is one of the state’s top quarterbacks and will keep Dodge City in any game, but Heights is more talented across the board. The build-up of this game may be somewhat diminished by the two teams coming off of tough losses, but this East-West showdown will still provide a measuring stick for teams on either side of the bracket. Blue Valley visits Salina South in one of two scheduled battled between the Eastern Kansas League and the Ark Valley Chisholm Trail League in Week 3. Salina Central travels to suburban Kansas City to take on St. Thomas Aquinas in the other match-up. Last season, Salina South notched an impressive road win with a 28-7 win at Blue Valley in a game their defense dominated. The Cougars held the Tiger offense to just over 100 yards of total offense and only six total first downs. In fact, Blue Valley’s only points of the game came on a blocked punt and return for a touchdown in the fourth quarter with the Tigers already trailing, 28-0. Salina South rushed for more than 360 yards in that game, led by Mike Jones who went for 149 yards. In last week’s loss to Maize, Jones was slowed to 77 yards on 20 carries after rushing for 207 yards in the Week 1 win over Derby. Blue Valley has experience in slowing down fast running backs. The Tiger defense held Kansas-commit Traevohn Wrench to 75 yards on 22 carries in Week 1 this season. The past two seasons, Blue Valley has held Wrench to 104 yards on 45 carries. For the Tigers to be successful, the offense needs to take care of the ball. Blue Valley committed five turnovers in a 24-15 home loss to Bishop Miege last week. The Tigers fumbled inside the Miege 5-yard line and had an interception return for a touchdown. Look for the Cougars to pull out another hard-fought game with the running of Jones and the big play connection of Justin Stonebraker to wide receiver Zach Nachbar. A pair of unbeaten Class 3A teams will collide in Salina as No. 4 Sedgwick will travel to take on the Sacred Heart Knights. These two teams played one of the more entertaining games of the 2012 season when Sacred Heart escaped with a 31-28 overtime win on a Tymony Bonilla field goal. The Cardinals and Knights combined for five turnovers in the first half, but settled down after halftime as Sacred Heart took a 21-6 lead. Sedgwick’s Dalton Brandt answered with a pair of touchdown runs to pull the Cardinals within 21-20. The teams traded touchdowns one more time with Sedgwick adding the two-point conversion to tie the game at 28. Late in the game, Sedgwick’s Brylie Ware connected with Logan Thompson on what appeared to be the go-ahead touchdown pass, but Thompson was ruled to have fumbled before he crossed the goal line. The game went into overtime tied at 28. Sedgwick scored first in overtime, but the play was negated by penalty. Bonilla and Sacred Heart answered shortly after with the winning kick. 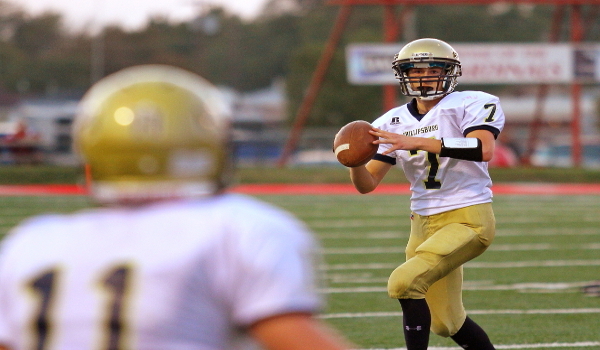 This season Sacred Heart has rolled to shutout victories over Hutchinson Trinity (28-0) and Republic County (46-0). Senior quarterback Nick Wuthnow returns to lead the Knight offense after throwing for more than 1,500 yards and 18 touchdowns a year ago. He also added more than 600 yards on the ground in 2012. Trevor Webb leads the Knight rushing attack after posting more than 100 yards in the season-opening win over Hutchinson Trinity. Sedgwick is led by running back Dalton Brandt, who contributed 201 rushing yards and three scores in a 35-14 win over Marion last week. Junior quarterback Brylie Ware passed for 302 yards and two touchdowns in that win over the Warriors. This should be another great game, but expect Sedgwick to find a way to pull this one out on the road. Oakley, Lyndon and Centralia are the lone 2-1A teams that have not allowed a point. Oakley has outscored opponents 96-0 en route to big victories against Colby and Sublette. The Plainsmen are 0-3 against Phillipsburg –Class 2-1A powers Meade and Smith Center are the only other teams Oakley has played more than once in the last nine years and not beaten. Oakley lost 54-6 last season, 49-28 in 2011 and 21-7 in 2010. Phillipsburg graduated a strong team that included two Division I players in quarterback Sean Newlan (Kansas State) and kicker Justin Juenemann (Minnesota). The Panthers delivered shutouts against Plainville and Oberlin by a combined score of 74-0. Senior quarterback Riley Juenemann has put together a strong start after he started four games last year when Newlan was hurt. He completed 16 of 24 passes for 325 yards and a score. Senior Hunter Kohler has rushed for 255 yards, while Grant Wickham has 121 yards. The Panthers, a 3A school, have more depth and team speed. Oakley likely has the stronger defense and more experience. Special teams and turnovers is likely the difference in a low-scoring game. This early-season matchup has been an excellent barometer for both Central Prairie League squads. Victoria won the first game in 2010, but Ness City has won the last two. Victoria has reached the playoffs 11 straight seasons, the longest current streak in eight-man football, and Ness City has won 15 straight contests after an Eight-Man, Division I state championship a year ago. It is currently the state's longest eight-man run. Ness City defeated Macksville 50-48 last week after Victoria beat Macksville 58-30 in the first week. All of the points in the Ness City/Macksville game came in the first and third quarters. Ness City, which returned just one starter from last season, had 64 rushes for 407 yards and six TDs by six different Eagles in the Macksville victory. Junior Jacob Hoss had 16 carries for 104 yards and a score. Victoria’s high-flying offense put up more than 500 yards against Macksville and then delivered a 54-8 victory against St. John. Victoria has a veteran unit that includes senior quarterback Sam Ottley, senior linemen Nathan Kuhn and Trenton Klaus, senior running back Clayton Roth, junior running back Bryan Dome and junior end Noan Dreiling. Victoria delivered 405 yards of offense, including 10 carries for 111 yards for Sam Ottley. Ottley completed five of seven passes for 175 yards and two scores. Victoria has more than 150 penalty yards in two games, but its offense looks virtually unstoppable.